I don't have one of those upper ones on my own Saratoga. You are right about the lower one being the ballast resistor. I also own a 1960 Saratoga ..... No fluid would come from the bellows, as it is completely independent from the hydraulics. You must have a leak in the master or a line coming from it. As far as getting your bellows booster rebuilt, the best place is Booster Dewey in Portland OR. http://www.boosterdeweyexchange.com/ I've had him rebuild a couple of boosters for me. from 1957-1961 there were two types of boosters used, the bellows type and a steel canister type, ( which is on my Saratoga) and they are interchangeable. The master cylinder you need is the same as the one used in the Windsor or New Yorker. There's a fair amount of mis-information above - The High-deck 383 was not factory installed in the DeSoto, only on the US built Chrysler Windsor and Saratoga in 1959 and 1960. The DeSoto used only the low deck 361 and low deck 383 engines. Cross Ram setups were installed on both Low decks and High decks in 1960 and 1961. 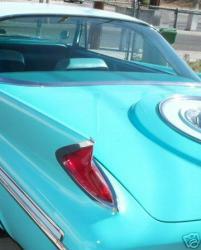 Cross rams WERE optional on Plymouth, Dodge and DeSoto 361 and 383 low deck engines in 1960, and Dodge/Plymouth in 1961. I had a set installed in a 1960 Polara back in the 80s but didn't have the exhaust manifold heat riser setups for them so it was a bear getting the car warmed up and I eventually put the single four barrel back on and sold the rams to a 300 owner. Those exhaust heat riser pieces are the very hardest to find of the entire setup. So you will need the carbs, the cross rams, the cross-over piece, clamps, block offs plates for the heads, bell crank type linkage, exhaust manifold parts, air cleaners...... in short expect to pay at least $4000. US if you can find it all. The fender wells also had special removable plates so you could get in to change the spark plugs from behind the front wheels, as you can't change them from above with the cross rams installed. In short, I wouldn't do it if you want to enjoy the car a lot. A dual in line four barrel progressive linkage setup would be much easier and cheaper to find and install, with a whole lot less parts to find and also gives better fuel economy than the x-ram setup. The In line setups were used in 58, 59 and 62, but you would have to find a correct dual four intake manifold that fits a low block engine as the manifold for the high block engine is wider. I owned a 1962 Chrysler 300 with the inline dual setup for 26 years and it always ran great and fuel economy when driving normally was excellent. This is the setup that was in my 300. Bump - items are still for sale.